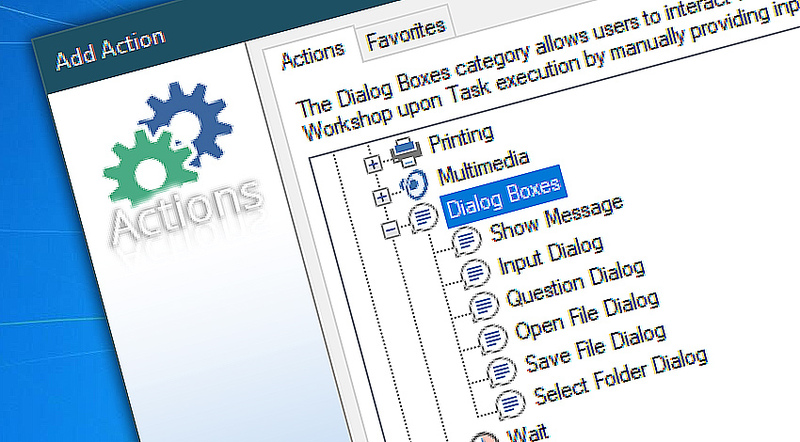 The Dialog boxes category features Actions that bring user interaction right into the automated Tasks. Typically, the work on computer is either directly user-driven or fully automated. Automation Workshop provides tools to combine the power of automation with human control over processes. Even for complex Tasks sometimes it is sufficient to ask user only one question while seamlessly performing the bulk of automated operations. Dialog boxes Actions either inform user about something by showing a message on screen or require user input to use it as a parameter which directs Task execution. Displayed messages can contain both fixed text and variable text that tells something about system state and processes, information from completed Actions, the state of current Task, file contents, etc. Dialog box Actions like Show Message, Input Dialog and Question Dialog can close automatically when the provided amount of time expires. The default answer is then assumed. Show Message opens a window in graphical user interface that displays plain text message. User can confirm the message or, optionally, it closes automatically. Input Dialog shows opens the window which requires user input. Dialog assumes default fixed or variable value if no user interaction happens for the specified amount of time. Question Dialog presents user a text message along with Yes/No choice which determines how the Task is continued. Open File Dialog demands user to indicate a file. File name and path is saved into variable value and is accessible from the following actions. Save File Dialog demands user to indicate a file. The filename is accessible from the following actions by using Variable Wizard. Select Folder Dialog shows a short message and requires user to specify a folder. The specified folder is saved into Variable Wizard value which can be used by all following actions for any reason. Show Message · shows user a message in popup window. Input Dialog · asks user to provide some data. Question Dialog · asks user to answer a yes-no question. 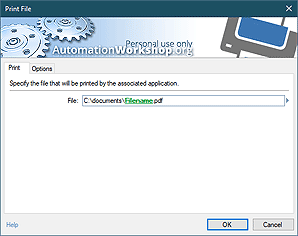 Open File Dialog · asks user to specify file name. Save File Dialog · asks user to specify file name. Select Folder Dialog · asks user to choose folder.